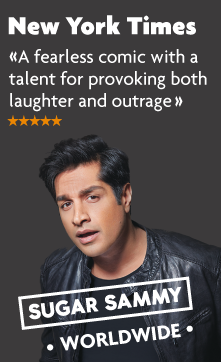 Sugar Sammy is one of the hottest comedians on the international circuit. The New York Times calls him “A fearless comic with a talent for provoking both laughter and outrage”. He has performed over 1600 shows in 31 countries and is touring the U.S. once again. Sugar Sammy is a charismatic provocateur whose worldly outlook allows him to hit on cultural, social and political themes with great charm and finesse. He is a king of crowd work and his audience interaction makes for a unique performance every time.